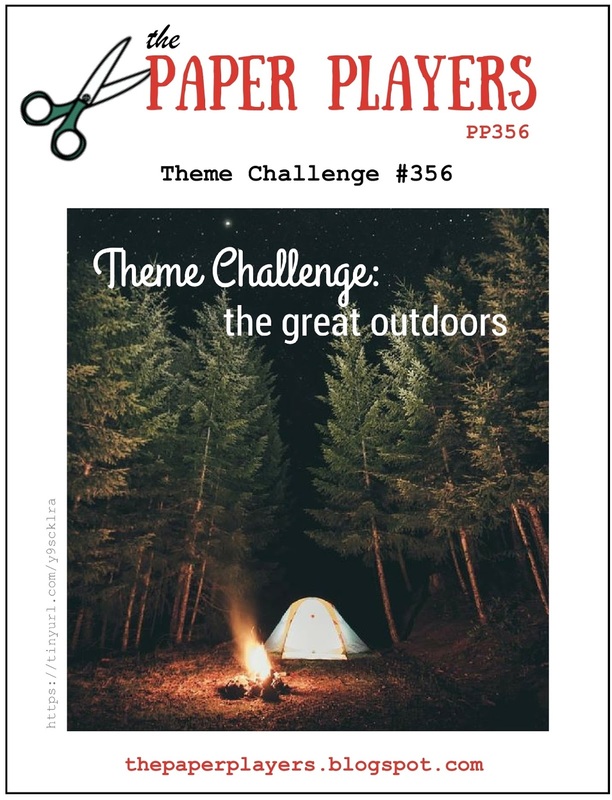 I got my preorder for the brand new Holiday Catalog this week, and I just had to play along with this Great Outdoors challenge from The Paper Players. This card is not hard to make at all, but it is very time consuming. 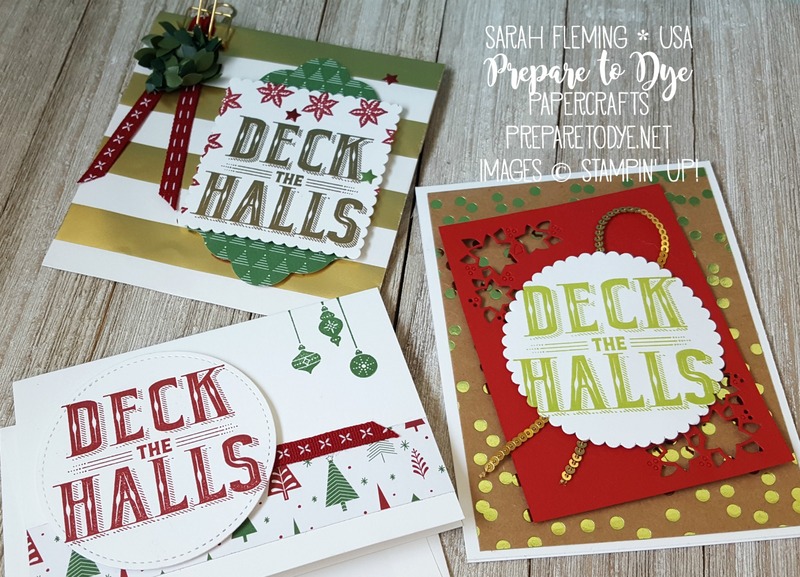 I suggest starting by using both of the full swag dies from the Christmas Staircase thinlits (coming September 1, available now for demonstrators) and cutting about 20 swags. 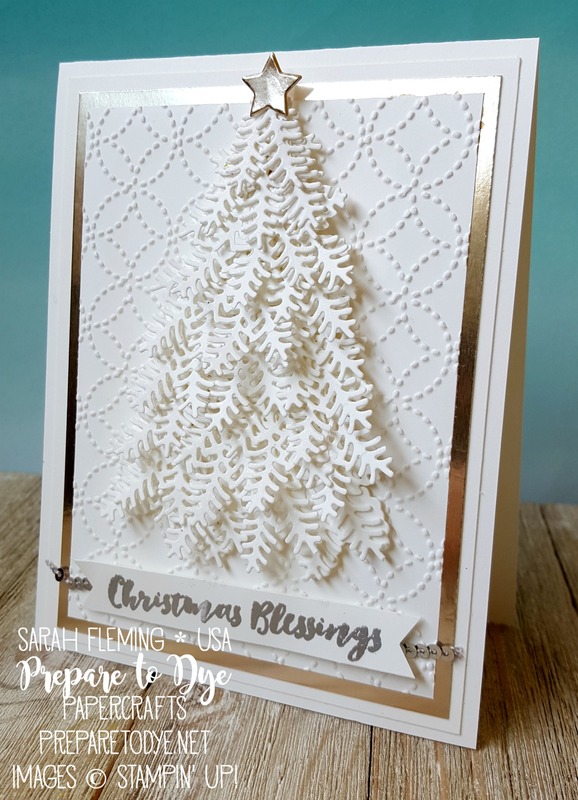 Also cut out the full tree framelit from the same dies in Whisper White. Starting at the outside and on the bottom, glue down a swag on each side, right up to the edge of the tree. Then glue two swags on the inside. Do another row of swags right above it, again starting from the outside and moving in so the middle branches are on top. Continue all the way to the top of the tree. Once you’ve gone all the way up the tree, use the small branch dies to cut branches for the very top of the tree. Glue these on, then use more of these to fill in any holes in the tree. To assemble the card, I used a Whisper White Thick card base, a regular Whisper White frame (4″x5-1/4″), and then another frame (3-3/4″x5″) using the brand new Champagne Foil Sheets (coming September 1). Make sure to cut the centers out of any foil sheets that will be hidden behind other panels. The foil is too pretty to hide! My top panel is embossed with the new Quilt Top embossing folder (coming September 1) and measures 3-1/2″x4-3/4″. The tree is popped up on Dimensionals. 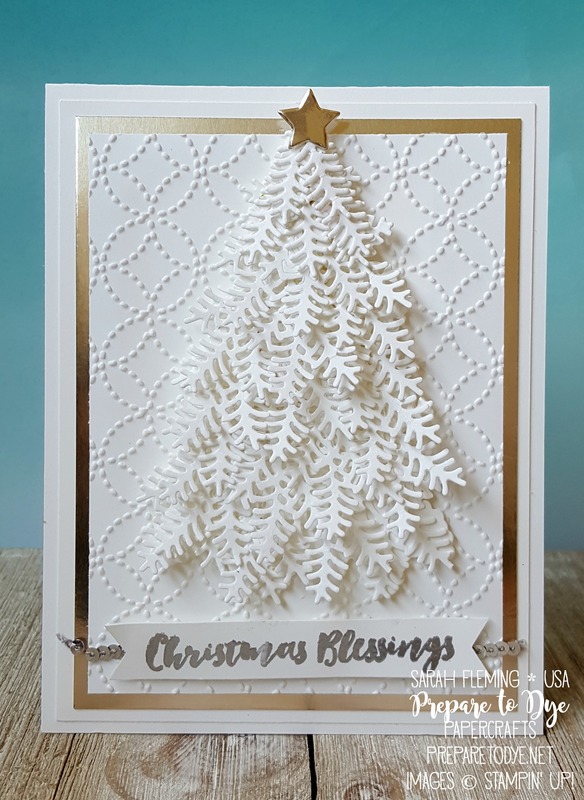 I heat embossed the sentiment (from Christmas Pines) with Silver embossing powder on a strip of Whisper White. I flagged the ends with the Banner Triple Punch. Under the sentiment is a strip of Silver Mini Sequin Trim. I’m hoping Stampin’ Up! 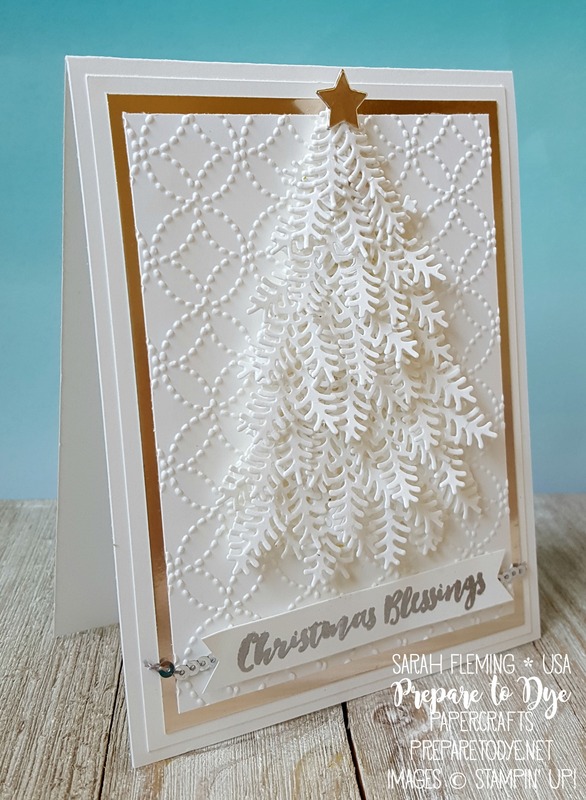 plans to come out with all of the metallic things in Champagne — embossing powder, sequin trim, and I’d love to see the return of Champagne Glimmer Paper. I topped the tree with a star cut from Champagne Foil Sheets with another die from the Christmas Staircase thinlits. 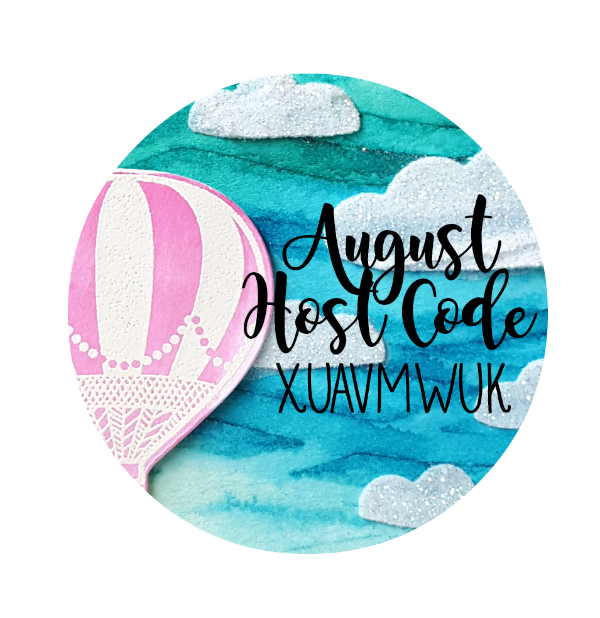 Some of the products I used are available now, and the rest will be available from my Stampin’ Up! store on September 1st. 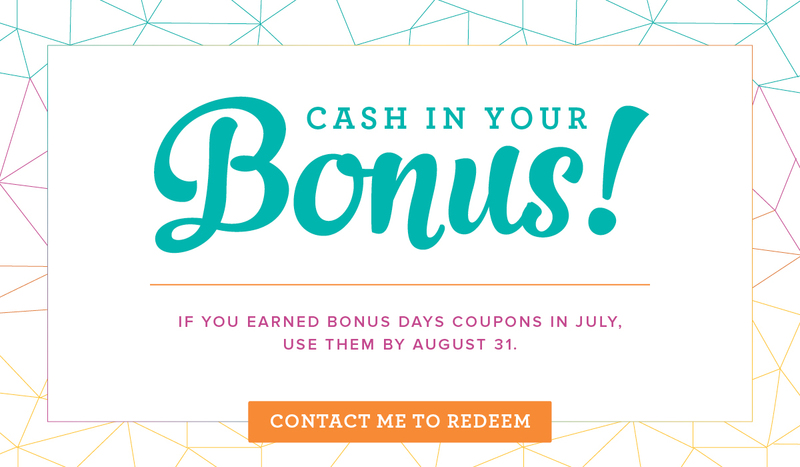 Or you can join my team today and add these products, including the sneak peeks, to your Starter Kit! 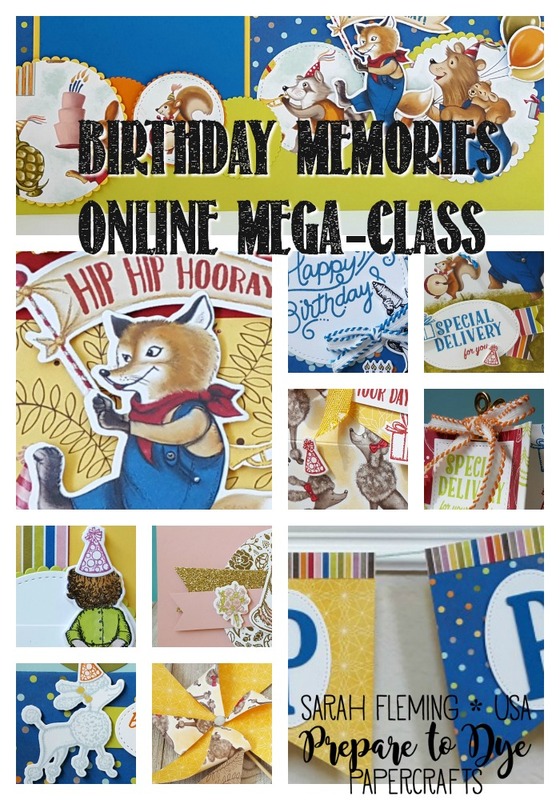 What a fun and creative idea! Your tree is beautiful, worth the extra time for sure.Thanks for joining us at The Paper Players!